Mr Hef and I have now been together for 7 years, yes SEVEN. I can't quite believe it myself, especially as he does ridiculous things on a daily basis, (yesterday he pulled me backwards off the end of my bed, for no reason, resulting in my back hitting his bony knees with quite a lot of force. And at the weekend he drunkly hunted me with a BB gun) but his ridiculous ways are why I love him and I really wouldn't have it any other way. So it was his birthday and our anniversary last week and I've made him a cake every year. This year I was debating it, as he wanted to throw the Slutty Brownie cake I made him last year away (I think my baking embarrasses him) so I asked him if he wanted a cake. He said no, but sounded a little hurt that I had even asked. So I ended up making him one any way. As I have previously mentioned, Mr Hef doesn't actually like cake, so it's a bit tricky. He does however love cookies (as you can see from the previous birthday cakes) and cheesecake. So this is how this cheesecake was born. It was born in to a world where Mr Hef was too drunk to eat and I was quite sure it would be destroyed before he even got to it (this was cemented by the fact that Mike, of kitchen assistant fame woke me up at 2am to tell me it had already been eaten). 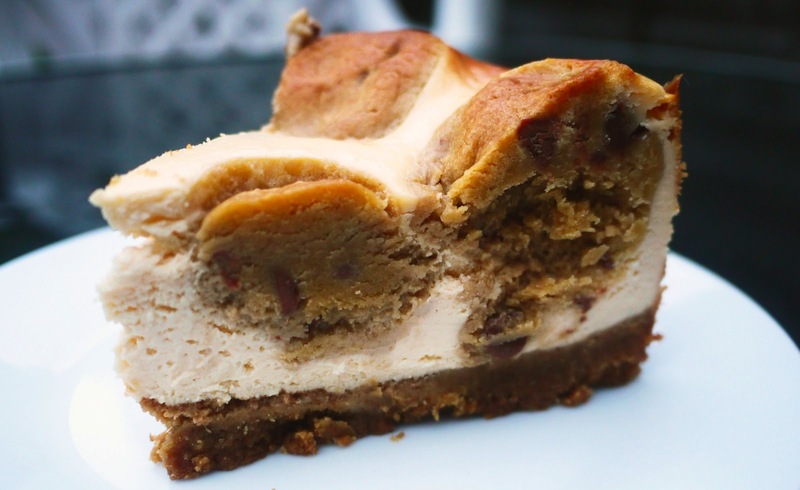 Anyway cheesecake + cookie dough = good, the end. Pre heat the oven to 200 degrees, then start by making up the cookie dough. Cream the butter and sugar together in a large bowl until soft and fluffy, then beat in the egg and the vanilla extract. Tip all of the dry ingredients in and beat until you have cookie dough and leave to one side for now. Take your crushed digestives and the melted butter and mix well until it is all combined, then pop the mixture in to a well greased (high sided) 8 inch cake tin and flatten down with the back of a spoon. Pop it in to the oven for 15 minutes, then leave to cool fully. Pop the cream cheese, corn flour and sugar in to a bowl and beat with an electric whisk until smooth, add the eggs and keep mixing until all combined, finally gradually add the cream and keep beating until lovely and smooth. Cover the top of the cake pan with foil and bake for 35 minutes, then remove the foil and bake for a further 10 to brown the top. Remove from the oven, let it cool completely then pop it in the fridge for a couple of hours before getting stuck in. Wow - this looks amazing. I think I'll be dreaming about this cheescake tonight! Oh wow - I need this!